Are you hoping to populate your form fields from an external Excel Sheet? Perhaps you wanted to pull existing records and display them on your form? If so, your long wait is over. 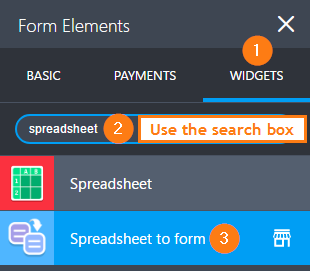 Meet the new Spreadsheet to Form Widget. The Spreadsheet to Form Widget allows you to upload a spreadsheet to your form and use the values you have on the spreadsheet to pre-populate the form. By using a unique code present on each row of your spreadsheet, you can access that specific row when it matches the unique code entered on the form. Think of it as querying a database using the Unique Code as the key index. 1. The widget requires an .xls, .xlsx, or even a .csv file and it won't accept any other format. 2. The Unique Code on your sheet doesn't necessarily need to be on the 1st column. You can place it anywhere for as long as you configure the widget with the respective column index (more on this later). 3. The Unique Code is case-sensitive. 4. The Column Names on your sheet should match the Field Labels on your form. Then, the column names on your sheet should be labeled exactly the same. 5. The arrangement of the form fields on your form won't matter even if you have other fields in between. What's important is to ensure that the Field Labels and Column Names match. 7. When the Unique Code is correct, the values inside the fields to be populated will be cleared and replaced by the values fetched from the spreadsheet. If everything above looks good, let's get on with it! Step 1 - Prepare your Spreadsheet and Form. Step 2 - Add the widget to your form. Step 3 - Upload the spreadsheet you'll use. NOTE: The bigger the file, the longer it will take for the data to load on the form. Step 4 - Setup the other options on the widget. The Unique Code column index. This will help identify each data row you want to appear on the form. Say, your Unique Codes are placed on Column K in Excel, then you type in K on this section. The column labels row number. 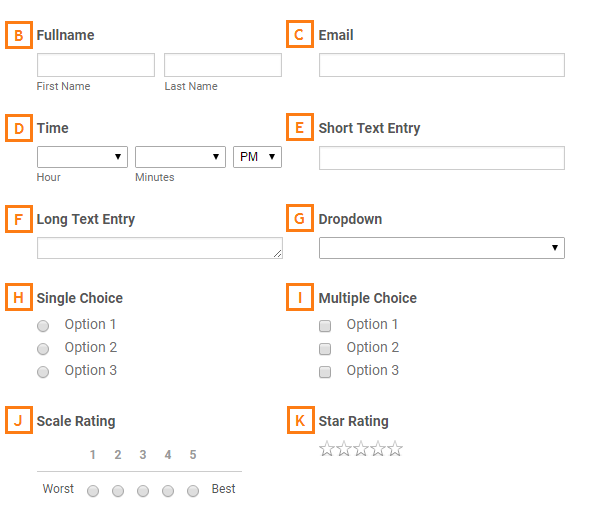 This will identify each column label and fill in the exact question label from your form. Same idea applies if your column labels are on Row 1, then type in 1 on this section. The other options, Fill Button Text and Loading Message, are relatively straight forward. If you want to use this same spreadsheet to do your own tests, feel free to download it from this link. If I make field as required, it does not pull the information, but same filed if is not required (optional), then it pulls information. Try value 1 in unique to pull value. My form is able to pull information when in single page mode, but one question per page mode its not pulling information. Please advise. This is wonderful, I'm so excited to use it. My first use case includes fields that have digits. I saw the list of accepted fields, and "number" isn't one of them. Is this still true? Or if I've missed something please let me know where to find special instructions for importing numbers. the data is not updated in PREVIEW. -Internal error: Access code column must point to a single cell only. NOTE: The values are not the same. 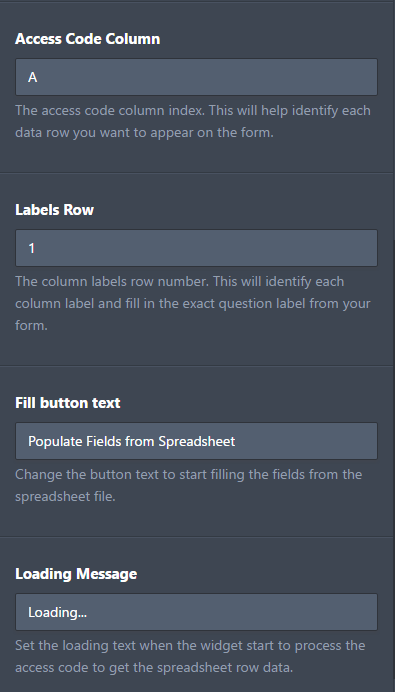 I have just posted this here https://www.jotform.com/answers/1725422-Spreadsheet-to-Form-widget-Is-lookup-functionality-available-to-select-unique-code/, but it might be better placed here. There is a problem, as it is not possible to use dropdown or (forced) autocomplete, so the user has to know beforehand, what to write exactly and how to spell this - which is not practically possible. I attached an "edit-form" link to my autoresponder, so the client can update his form submission. If he does though, your two-page soltution does not work, the field does not get prepulatedt. Any solution or workaround? That would be so important. Actually, this is already a workaround, what really would be needes is the combination of the autocomplete-functionality (or also the dropdown-functionalitiy) and the spreadsheet to form widget! Cool widget, but it would be much more useful if it could fetch the data from an online Google Spreadsheet, and configure the lookup function on endless columns. That way the data source could be updated constantly without having to upload new files... do you plan to add a functionality like this anytime soon? I have a small question on this. Instead of using an excel spreadsheet that needs to be uploaded each time, can we get the widget to look up data that sits at the backend of this form itself? I'm trying to get my form to identify someone who has revisited us, greet them by name and prepopulate their details in it. Is there an answer to tutuprat and ViaInsideSales' questions? I want to do the same thing and have a pre-populated (drop-down) instead of text question. Same as last question, any way to make it as a dropdown instead of a text field? Also, will this widget populate hidden fields? I want to have several answers on the final submission but I want the end user to only see a few. How can I include the number option and the input table, to get populated with spreadsheet to Form Widget?, or is there another option to get pre populated? I have the option multiple choice, but is not working, how has to be displaid in the excell cell? Can you suggest an easy way to prevent errors from users entering the unique code incorrectly (typos). For example, would it be possible to populate the input field for the unique code with a user's previous selection from a dropdown? Is it only possible to have one Unique Code input field per form? I can get this to work great, but need the ability to add multiple fields and have unique information pull for each. When I add a second Spreadsheet to Form Widget, and enter the next Unique Code, it updates all fields, even those for the previous entry. I'm trying to create a form where the user inputs an item number and then the description, pricing and details for each is auto populated. Need to be able to have multiple entries, 10 - 20 items per form. i tried testing the data but i get the error "undefined"
Is the spreadsheet to form widget really working? Have tried several spreadsheets plus the one given to use as an exemple but non seems to work. I am trying to use the spreadsheet to form widget but it is not working. I have checked my access code columns and label rows and everything looks right. Does this widget no longer work? I created my form and uploaded the excel file but when I publish the form and enter a unique ID from the spreadsheet, the form just says "loading" and does not ever change. My column headers match the short text entry labels. I need to evaluate the a field that is filled from the spreadsheet file. Based on its value, I will show or hide more information. It seems like the field is not being evaluated. Is there anyway to customize the message "Cannot find access code"? Is it possible to change the text that is shown below the button after it is clicked and has completed its operation? This looks very interesting. For what purposes do people use this widget? How can i make this widget 100% automatically? I have intergrated my form with google spreadsheet. But i cannot use that google spreadsheet in my google drive account to lookup data. So I need to download it and save it in .xlsx. Is there is any solution for that? Does this work with any spreadsheet and does it have to be uploaded into the form? Does the spreadsheet need to have public access? I keep getting Server Error when I attempt to upload my file. The file is on my desktop and is only 30kb. What am I doing wrong? I have a spreadsheet loaded that has a unique code in one of the columns. Every attempt to get it to populate the one form I have in my account results in "Unknown access code". This is sooooooo cool and will be very helpful for us!! Thank you! Is version2 of this widget going to allow connecting to spreadsheets online (like Google Sheers) via URL?